IT IS well known that The Hollies were part of the 1960s ‘British invasion’ when UK pop acts made it big in America, but what isn’t quite so well known is that from 1963 to the early ’70s they had more hits than The Beatles. In that short period they had 18 Top 10 hits, including Stay, Just One Look, He Ain’t Heavy and The Air That I Breathe. What’s more, they’re still touring with original members – powerhouse drummer Bobby Elliott and singer, songwriter and lead guitarist Tony Hicks. 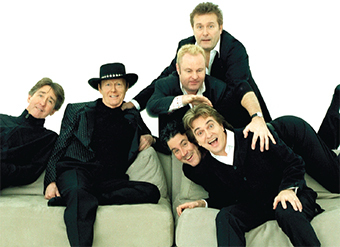 This year, The Hollies have played to sellout audiences across Australia and New Zealand, where The Hollies Greatest Hits was in the album chart. Throughout 2014 they have continued to promote their double album, We Got The Tunes, in Norway, Sweden, Finland, Germany and Belgium, culminating with the autumn theatre tour in the UK – which brings them to the New Victoria Theatre, Woking, on Sunday (October 19).